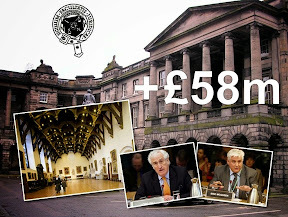 Transparency gained little from private meeting with Lord Gill, MSPs. THE tiny concession of a promise to look at the lumbering Scottish Court Service computer system is all Scotland’s top judge, Lord President Lord Brian Gill managed to concede in a private meeting with two MSPs from the Scottish Parliament’s Public Petitions Committee who are currently investigating a call to declare judges’ full and complete interests in Petition PE1458: Register of Interests for members of Scotland's judiciary. 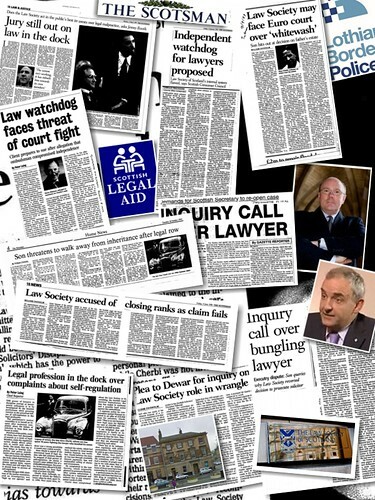 The situation on a further point, relating to declarations by judges Gill, Carloway, Bannatyne and Sheriff Principal Alistair Dunlop and three other judicial colleagues who serve on the board of the Scottish Court Service also became murkier when it was claimed that information of this nature had come as a revelation to the msps who privately met the Lord President and would be part of an expected letter from Gill to the Petitions Committee. 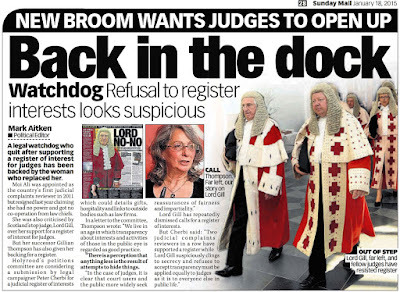 SCOTLAND'S top judge, who refuses to back a register of interest for members of the judiciary, has conceded a minor reform to boost transparency. 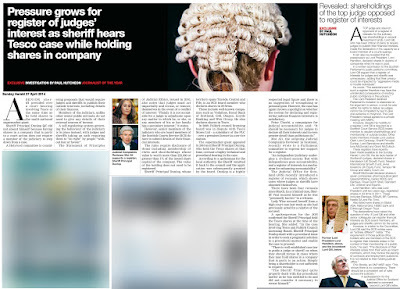 The Lord President, currently Lord Gill, is looking at pulling together information about judges declining to rule on cases due to a perceived conflict of interest. 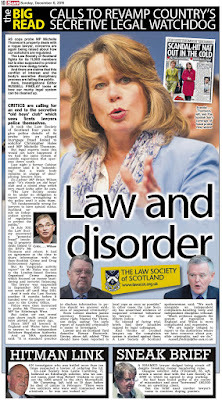 MSPs who have criticised the lack of openness in the judiciary welcomed the shift in direction. 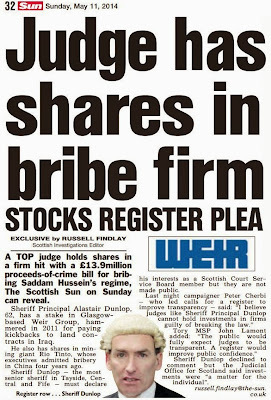 Holyrood's Public Petitions Committee is considering a proposal that would require judges and sheriffs to file a register of financial interests, which could include shareholdings and directorships. 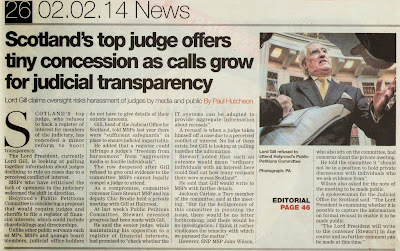 Unlike other public servants such as MPs, MSPs and quango board members, judicial office-holders do not have to give details of their outside interests. 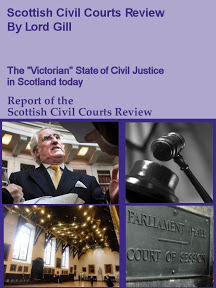 Gill, head of the Judicial Office for Scotland, told MSPs last year there were "sufficient safeguards" in place to ensure judicial impartiality. He added that a register could infringe a judge's "freedom from harassment" from "aggressive media or hostile individuals". 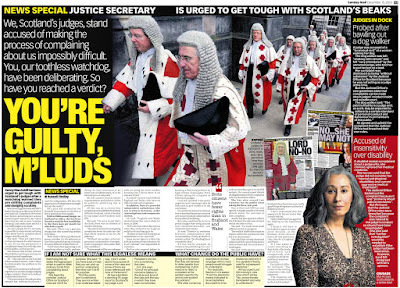 The row deepened after Gill refused to give oral evidence to the committee: MSPs cannot legally compel a judge to attend. As a compromise, committee convener Dave Stewart MSP and his deputy Chic Brodie held a private meeting with Gill at Holyrood. At last week's Public Petitions Committee, Stewart revealed progress had been made with Gill. He said the senior judge, while maintaining his opposition to a register of financial interests, had promised to "check whether the IT systems can be adapted to provide aggregate information about recusals". A recusal is when a judge takes himself off a case due to a perceived conflict of interest. No list of them exists, but Gill is looking at pulling together the information. Stewart added that such an outcome would mean "ordinary individuals with an interest here could find out how many recusals there were across Scotland". He said that Gill would write to MSPs with further details. Jackson Carlaw, a Tory member of the committee, said at the meeting: "But for the belligerence of this committee in pursuing the issue, there would be no letter forthcoming, and there would be no investigation. I think it rather vindicates the tenacity with which we pursued the matter." 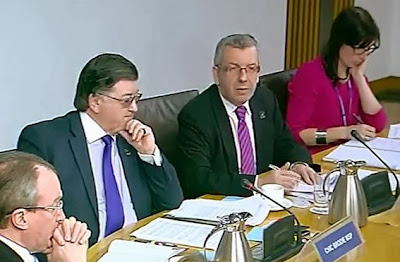 However, SNP MSP John Wilson, who also sits on the committee, had concerns about the private meeting. He told the committee it "should not be in a position to hold private discussions with individuals who we ask evidence from". Wilson also asked for the note of the meeting to be made public. 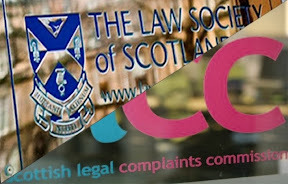 A spokeswoman for the Judicial Office for Scotland said: "The Lord President is examining whether it is possible to capture the information on formal recusal to enable it to be made public. "The Lord President will write to the convener [Stewart] in due course and no further comment can be made at this time." It is always welcome when senior figures in public life agree to positive change. 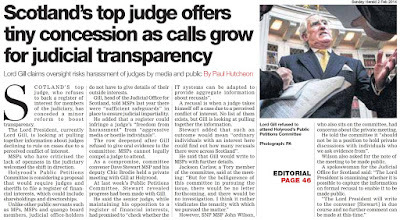 The Lord President, who is the country's top judge, is against requiring his colleagues to list their financial interests, but he seems to have recognised political concerns about a lack of transparency. 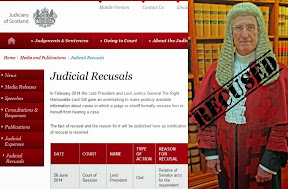 To this end, he is investigating the possibility of compiling a register of "recusals", which means examples of judges ceasing an interest in a court case due to a perceived conflict. However, the concession is only a tiny step forward and does not compensate for the way the Lord President has dealt with the bigger issue over the past six months. To recap, Holyrood’s Public Petitions Committee is considering a call for judges and sheriffs to submit a full list of their "pecuniary" interests. Such a requirement is not unusual in the public sector, where MPs, MSPs and a host of other public servants have to provide details of shareholdings and directorships. However, the Lord President believes the judiciary is different. In written evidence to the committee, he argued that the disclosure of financial information could infringe a judge's privacy and encourage harassment from "aggressive media or hostile individuals". MSPs on the committee wanted to question the Lord President about these views in person - an entirely reasonable expectation. However, our most senior judge had other ideas and cited a little known legislative clause that means judges cannot be compelled to give parliamentary evidence. In other words, he dodged scrutiny. 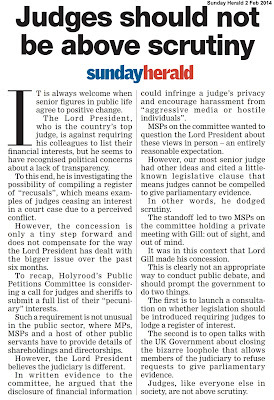 The standoff led to two MSPs on the committee holding a private meeting with Gill: out of sight, and out of mind. 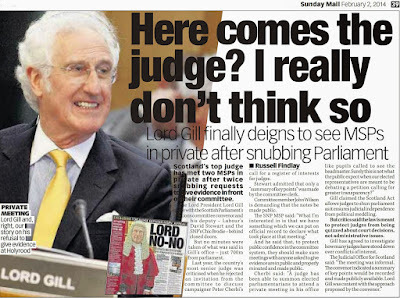 It was in this context that Lord Gill made his concession. This is clearly not an appropriate way to conduct public debate, and should prompt the government to do two things. The first is to launch a consultation on whether legislation should be introduced requiring judges to lodge a register of interest. The second is to open talks with the UK Government about closing the bizarre loophole that allows members of the judiciary to refuse requests to give parliamentary evidence. Judges, like everyone else in society, are not above scrutiny. LORD Gill met petitions committee members behind closed doors to discuss conflict of interests - but no minutes were taken. SCOTLAND'S top judge has met two MSPs in private after twice snubbing requests to give evidence in front of their committee. 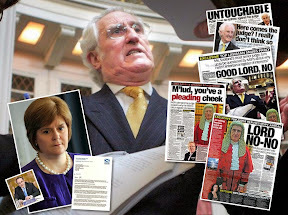 The Lord President Lord Gill spoke with the Scottish Parliament’s petitions committee convenor and his deputy – Labour’s David Stewart and the SNP’s Chic Brodie – behind closed doors. But no minutes were taken of what was said in a meeting room at the Parliament's Queensberry House. 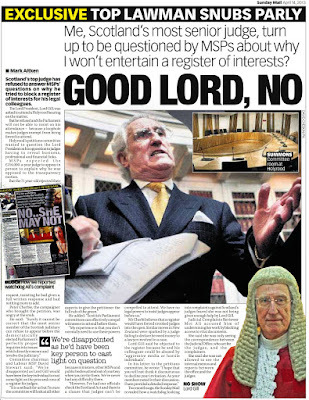 Last year, the country’s most senior judge was criticised when he rejected an invitation from the committee to discuss campaigner Peter Cherbi’s call for a register of interests for judges. Stewart admitted that only a “summary of key points” was made by the committee clerk. 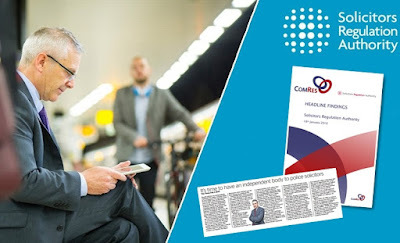 And he said that, to protect public confidence in the committee system, they should make sure meetings with anyone asked to give evidence are in public and properly minuted and made public. 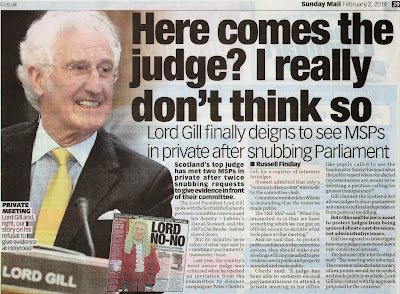 Gill claimed the Scotland Act allows judges to shun parliament as it ensures judicial independence from political meddling. But critics said the law is meant to protect judges from being quizzed about court decisions, not administrative issues. 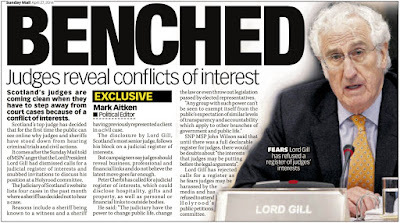 Gill has agreed to investigate how many judges have stood down over conflicts of interest. 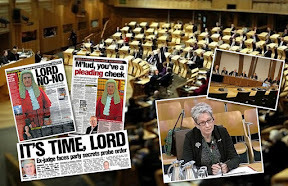 Petition PE1458: Register of Interests for members of Scotland's judiciary is due to be heard again at the Scottish Parliament in some weeks time after a letter has been received from the Lord President, who is apparently still refusing to attend the Scottish Parliament and face open questions from all Committee members regarding judges hidden undeclared interests. Very good and the editorial totally sinks the judges. 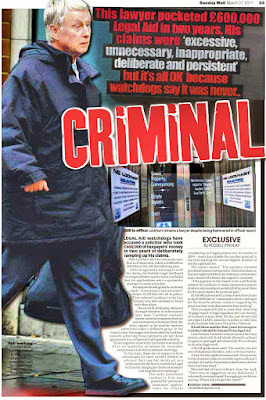 I will put the Sunday Herald on my shopping list along with the Sunday Mail now! "Judges, like everyone else in society, are not above scrutiny." And now the MSPS should do something and take this to a further stage also Gill should be asked to come back in whether he wants to or not. "MSPs on the committee wanted to question the Lord President about these views in person - an entirely reasonable expectation. In other words, he dodged scrutiny." 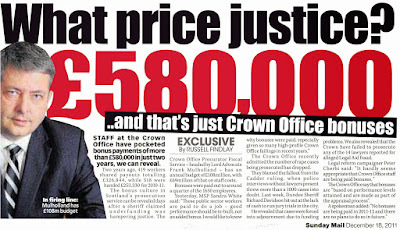 Yes and is this what we should expect from our top judge?An utter disgrace! The car wreck instituted by the judge continues and transparency is the main victim as is clearly the intention of the judiciary. Glad to see the Herald give the story a good showing and come out with that editorial. I wonder what else is going to be in this letter from Gill to the petitions committee anyway what an insult the judge sending letters to the parliament just because he is refusing to show up to face the music and how many times is it now? 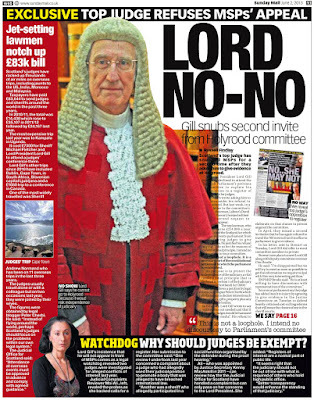 Gill has no credibility left I think people should now be questioning all decisions in the courts because you have proved with this register thing the judges cannot be trusted at all. 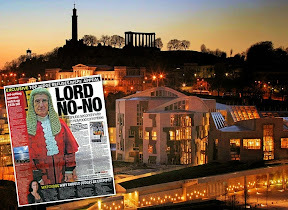 It will not have gone unnoticed by the Scottish Parliament that Lord Gill has created an unsavoury Precedent where secrecy is sought and transparency diminished? The consequence of this is one very shooglie peg? 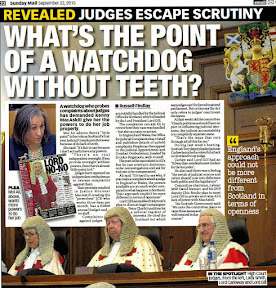 The award winning BBC special Investigation Team blowing the whistle on the corrupt and lying Law Society of Scotland and Scottish Solicitors Discipline Tribunal and now award winning Investigative Journalist and Editor of the Scottish Sunday Herald, Mr Paul Hutcheon firmly exposing fallen standards with Scotland's Judiciary, shows that the tide of secrecy and self-interest with Scottish lawyers is on the turn? 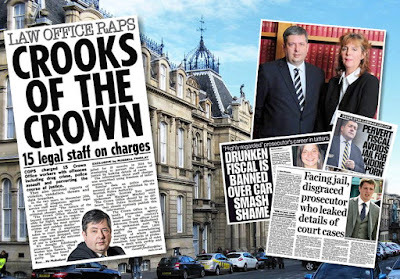 We are already seeing Scottish lawyers turning on the crooks at the Law Society of Scotland and it may only be a matter of time that other Scottish Judges decide, due to damage limitation, that secrecy and unaccountability cannot be defended any longer in a just Scotland? About time they did something on this and made the judges register everything instead of all this smokescreen to water down the debate. 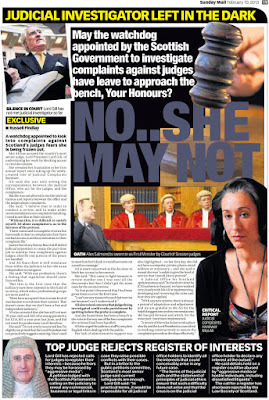 Given the weight of public opinion in support of Ms Moi Ali and her expert analysis in support of Mr Cherbi's Petition as, 'I don't understand why this isn't the law already....', how can Salmond and MacAskill explain their almost fanatical support of Lord Gill's indefensible position? The analogy is, 'C'mon boys follow me, I know which way to go here, we just need to stick together and walk-along-this-plank'? Scottish Judge: No sir, I have never heard of the word....? 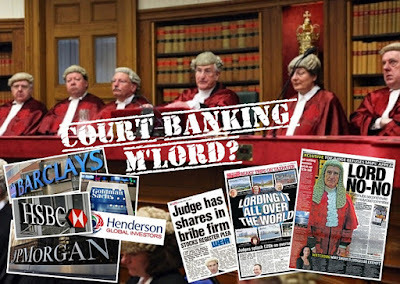 Here comes the judge - so lets all bow and scrape to him and give him what he wants! 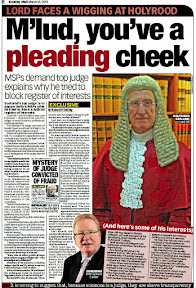 Ha .. a quick play with the old keyboard by the judge and these msps are satisfied with that? phew I am glad I do NOT live in Scotland! 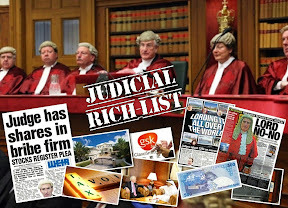 Perhaps this is their motivation - keep the judiciary and their interests quiet so no transparency no one gets to find out who is getting backhanders or who is a crook or whatever and then all the corrupt and sleazy will use the Scottish Courts for their own ends. Looks that way to me - if they want to keep it dirty keep it closed and keep the same old same old running the show so the ones in charge make all the money for themselves. This is probably going to sound like a stupid question. 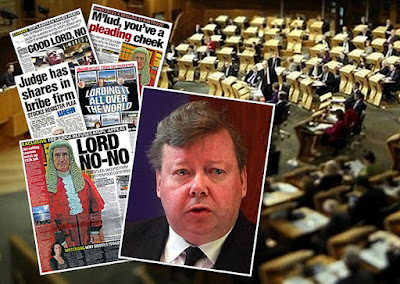 The judge refused to go to the parliament before so when he showed up at this meeting at the parliament why did the other msps on the committee not get in to see him and raise their own questions? Just beggars belief really this is going on and the judge can dictate what happens and who he speaks to and probably what they end up being able to report back. 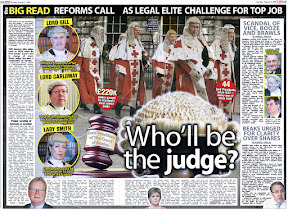 Is anyone actually in charge in Scotland or is it just these judges who are calling all the shots? 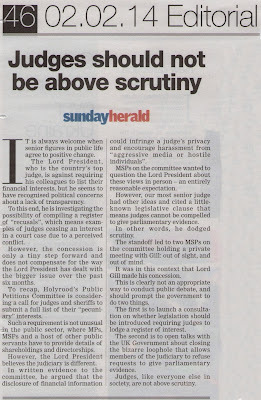 Obviously the Lord President is not in a position to face the entire complement of the Public Petitions Committee in a public venue for some reason ... nor does it seem Scotland's top judge wishes to face questions in public regarding his opposition to what is really just a call for much needed transparency in the judiciary .. Judicial dictatorship rides again and no one can question their motives otherwise its jail! Hope your register is up soon! 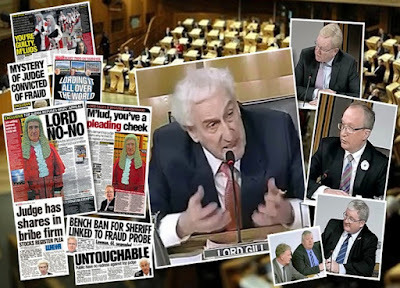 What you are actually witnessing here is the exact reason why the Lockerbie suspect Al Megrahi was allowed to be tied in a Scottish court- because they knew with the Scottish judiciary being so unaccountable,arrogant and vindictive the powers that be could easily get the guilty verdict they wanted and put the entire case on ice for decades. 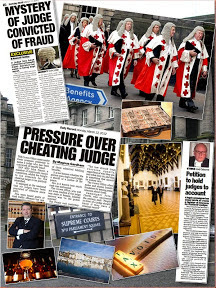 These judges have the power over the rest of us and this secret meeting with the politicians has proved it.Oh yes I saw those comments from one of the msps about nothing being done behind the backs of others but no one really believes that when watching the footage do they.This is judicial power gone mad and I do like how your approach on the small but most important issue of transparency has brought out the worst in these judges.I am very happy to see your newspapers understand this and are so willing to report on it.I hope for more and for success of your aims.Thank you very much whoever you are for all this. 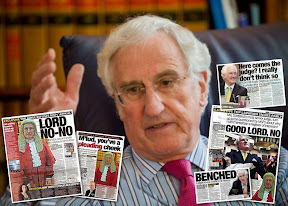 The real consequence and sting in the tail having bent the rules to accommodate Lord Gill comes where any Parliamentary Committee from this moment on 'invites' someone to appear before them to give evidence and they do exactly the same as what Lord Gill did, to say 'Go and Bile yer heed'? Once again the BBC highlight the consequences for Alex Salmond's Vision of Scotland? 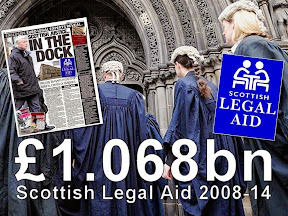 Last week the Law Society of Scotland were exposed for turning their noses up to the law-of-the-land where they were allowing known crooked Scottish lawyers to get-off-Scot-Free and the BBC revealed that £Millions of pounds was routinely being swindled from the Scottish Public's wallet via the Scottish Legal Aid Board Fund? This week it is the £800Million pounds being stolen from the Scottish Public's rapidly emptying wallet through the Scottish NHS? 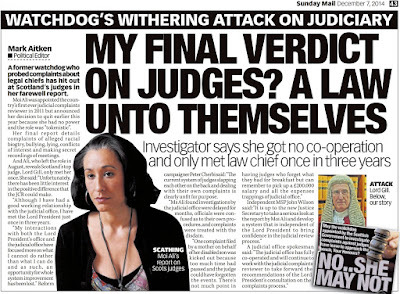 This is what happens when you allow people to be immune from prosecution in Scotland, like what has happened with crooked Scottish lawyers? 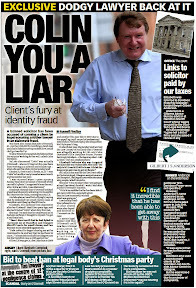 Other members of the Scottish Public, decide to themselves, well if Scottish lawyers are allowed to stuff £50 notes into their boots with impunity and get off with it Scot-Free then they say to themselves, well if these crooked Scottish lawyers are getting away with it, I am sure that I am going to copy them? 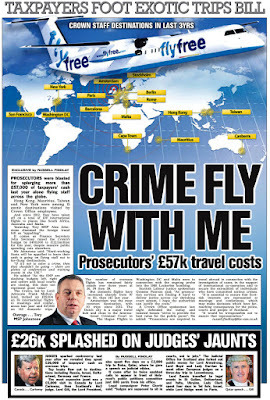 Alex Salmond needs to wake up and smell the burning haggis and realise that unless the core of Scotland is fit for purpose and the Public can see that the country is built on fair and just principles, which starts with the Scottish Judiciary, then the Police, then lawyers......then this is going to be just the tip of the iceberg of criminality within Scotland? 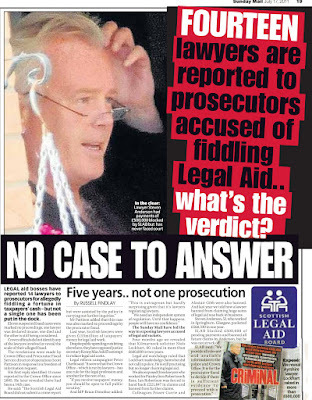 Yes really good to see other newspapers taking this subject on board now because it is obvious the judges cannot be excluded from the same laws and transparency the rest of us have to live with. BBC etc where are they on this?With all these headlines across the papers now it looks very odd to the point of suspicious there is no television coverage. Good points however it is unlikely the Lord President is going to argue against transparency on national television or answer questions as to why he deigns to appear before one Committee of the Scottish Parliament when it suits his interests to do so and then avoid another Committee when the questions are relating to the interests of the judiciary. The lesson here is... support newspapers and those in the media who are prepared to take a stand on issues and print news that impacts on all our lives. There is scarcely anyone who is not touched by the justice system in one way or another in their lives, and we must all live by laws, transparency and in times of need, require access to justice and a legal system transparent and accountable enough to serve the community before serving itself. 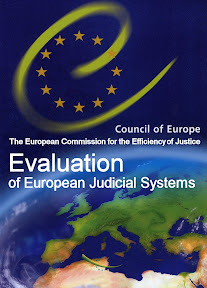 If members of the judiciary wish to do some good, they would do well to remember all of the above rather than placing their own vested interests and the current business model of the justice system above service to the community at large. Very good Peter.I can see why the Law Society,Gill and the rest will not share a stage with you due to the fact you can send them packing with a single sentence. 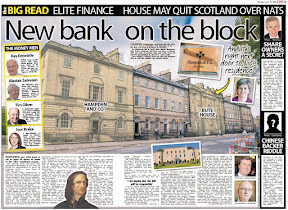 PS Don't worry I regularly buy the Sunday Mail to read all this!Sunday Herald also added! 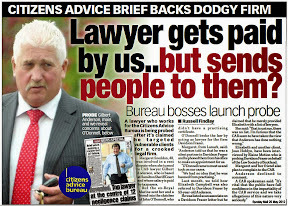 Lawyers are too keen to make a fast buck to worry about serving the community. Yes DOI I agree and we are not living during the times of the Divine Right of Monarchs to rule. This situation is outrageous and must not be tolerated. The Judiciary cannot be so independent they are actually above the law, but that is clearly the case. What is the saying about being in a hole and stopping digging? 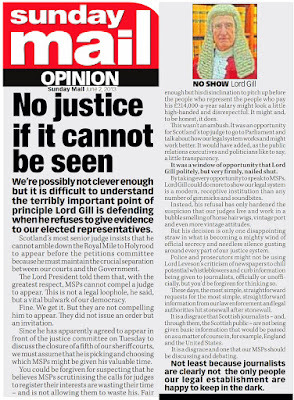 If Lord Gill can do as he pleases in relation to the Scottish Parliament where representatives of the public are sitting he has the power not the people of this country. It is an outrage and keep up the pressure as you always do. 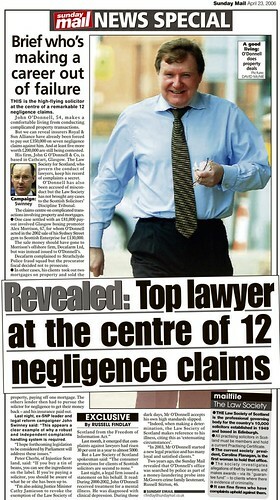 He clearly has a conflict of interest and his conduct is doing him no favours. 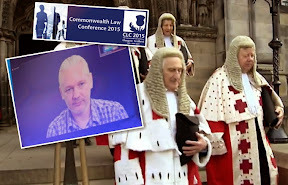 Could this be for the same reason as the Law Society of Scotland would not allow Philip Yelland (Director of Regulation) to be questioned by the BBC's Special Investigation Team? In case they were asked searching questions which would have resulted in them telling the truth and opening up a vat of worms or alternatively lie in order to try to maintain the status quo? 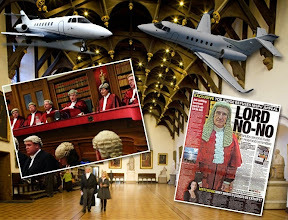 It is clear that the secrecy pact following on from Lockerbie has meant the sliding standards in Scotland ever since and the Scottish Judges have found that with this secrecy, they can get a lot more done......? Thanks for thought of the day however "serving the community before serving itself" does not keep a law firm running. 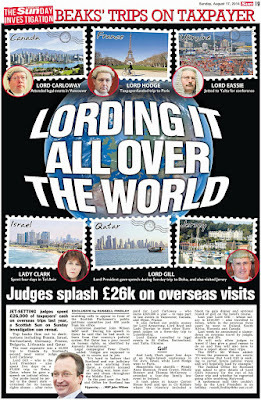 The worry must be if this register of interests comes in here (and it should) it will spread to other countries and also English judges who probably have as much stashed away as the Scottish judges. Anyway you are onto a winner here whatever happens so keep up the pressure! 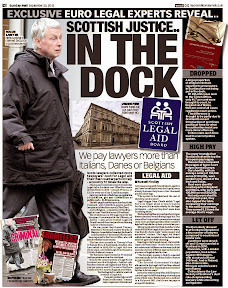 From personal experience I warn readers, the legal profession are dangerous people. 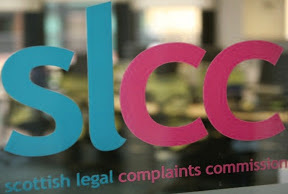 If you are ever in a situation where your access to rights are cut off because one of the Law Society's lawyers have ruined your life you will face an evil you did not know existed in a so called democratic country. 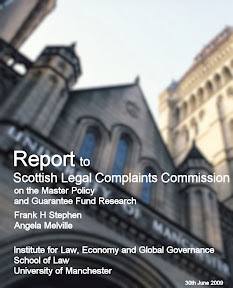 You will find what we found, that the complaints system is a farce, your MSP will repudiate you and no lawyer will represent you. How can you get a fair hearing in this situation? How can you be heard at all? The Police are not allowed to intervene because the command structure is above them. You can be made penniless, legally robbed, lose your home, family and health, even your life. Oh yes suicides have happened too. How can this happen? To have rights you need someone with legal power to act for you. But they are a brotherhood. If a lawyer ruins you, you become the enemy of all lawyers, their careers are more important than your life. Stay away from them, they are a dangerous faction of people. They control Scotland. They will ruin you before they will hurt one of their own. I do not see how tinkering with a computer system can equate with general interests, transparency and accountability?